Teddy, a better place for this discussion would be on your project thread. Is this for your steam shower? I apologize for missing the fact I wasn't subscribed to my own thread! Tool Guy - Kg: Thanks for the welcome! This is awesome to see such a solid conversation coming from my original question. I've really enjoyed reading up on the topics found here. The plumber did say I needed to slope the tray, and the county inspector said the same thing, until he saw the tray. Gozo - Central VA, eh? Happy to see local folks to me here in Henrico. RE:SLC - what depth did you need to level out on your floor? John Bridge - 1/8" slope is lower than I'd thought. Level is the name of the game. I have a cement grinding disc in my angle grinder for taking out the absurd volume of thinset that is on the slab now - SLC and that should allow me to get dead level. jadnashua - had I known the quality of the slab before starting all of this: I probably would have gone with mud. Kman - we're going with penny tiles: do you think the slope is enough for that to drain properly? A new question somewhat unrelated: there's a couple of spots of cat pee here and there. I've sprayed Nature's Miracle all over the place, but want to make sure our cat won't ever smell any lingering odors and think it's his bathroom (I can't smell it at this point). I've read Kilz would basically seal those spots for good, but then I assume I couldn't get a good bond if I poured SLC over it? But if I put the SLC over first, then Kilz, the thinset used for either the Kerdi tray or the ditra wouldn't bond, right? I realize local/state codes are all different, but I'm also getting conflicting information about vapor/air barrier install. The long wall of this shower is on an exterior wall. The permit office person said I needed a board with a built-in air barrier: I nodded my head and assumed they meant a PolyIsocyanurate product. So that's one authority saying that. The plumbers said simple 12mil plastic is what they'd use. That's a second authority (authority in the sense of: they've done this way more than me). The plumbing inspector said the vapor/air barrier should be on the outside of the wall (it is already) and the fact they'd ask for that is crazy b/c the homeowner would have to work from the outside, and that's just prohibitive. That's now three authorities that have said completely different things. (mind you, the plumbing inspector told me to check with the framing inspector). Any ideas suggestions? Last edited by gardnert; 10-05-2018 at 08:44 AM. Gardner, although most likely you would be fine with the penny tile and the foam tray, I would heavily consider a mortar base with that small a tile. If there is ever a point load on a section, I personally would be afraid of the foam not being strong enough. Compared to the foam tray, a mud bed is so cheap and so much stronger. Nothing beats it, really. Again, this is worst-case. For normal shower use, what you propose will be ok. If you must use the penny tile in conjunction with the foam tray, I'd strongly consider using a true epoxy grout to give additional adhesive strength to the installation. I don't think you'd have any drainage issues with that small a tile. It's more of a problem with larger tiles. If you don't add a geographic location to your User Profile so that it appears permanently it will be lost before we leave this page and that informations helps in responding to some types of questions, such as your air barrier/vapor barrier questions. Keep in mind that there is a great deal of difference between the two. I, too would recommend you dispense with the foam tray and make your own properly sloped floor using deck mud. That would eliminate any need to try to level your floor sufficiently to accommodate the poorly sloped foam piece and give you a better fit to the shower footprint and drain location. Not at all sure what Wolfgang means in saying that proper slope is less of a drainage problem with the smaller tiles than with larger ones, but perhaps he can elaborate. I think the third authority is referring to commonly used house wrap. Think Tyvek for instance, which is applied over the exterior sheathing and under the siding. Regardless of the house wrap, you'll need a vapor barrier for the shower walls - all of them. That could be something as easy as thick poly stapled to the studs with a tile backer board like Hardi or a cement board, or one of the foam tile backer boards, or a membrane over drywall. All 3 will satisfy code requirements. I'm gonna take issue with Dan just a bit on that vapor barrier comment. 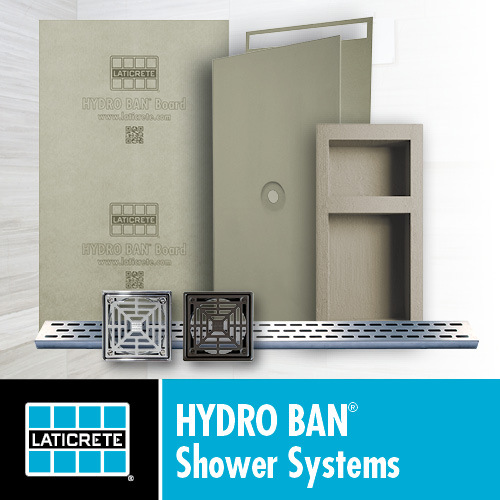 You will need a moisture barrier or a direct bonded waterproofing membrane on your shower walls, but you don't require a vapor barrier at all unless you are building a steam shower. CX, this is anecdotal from my own observation only but I found that, given a proper slope, smaller tiles retain less water through surface tension. Since the grout joints tend to be a little lower than the tile, smaller tiles in my view shed water more easily into the joints from where it slowly moves towards the drain. What I describe here pertains to the drying period after the shower is over, obviously. I, too would recommend you dispense with the foam tray and make your own properly sloped floor using deck mud. I take all suggestions happily, but I just paid the plumbers to bust up my slab to move the waste pipe for the shower based on this tray. Hindsight is 20/20. I am just going to have to keep chugging along with the plan of using the tray. I had not planned on using epoxy grout: I've read only stories that it's a giant pain to work with. But I'll take giant pain over wasting money (tossing tray and plumbers) at this point. Again, I do appreciate the input and welcome any more. Gardner, those stories about epoxy grout are either old or written by people who don't read the instructions. It's easy to work with if you follow the instructions. It's a disaster if you ignore them. But that's true of a lot of things. Concerning my own DIY experience, I find epoxy grout easier to install than cement grout. It's a superior product in a shower, too. But this now seems like it's not a concern over slope/drainage, yet the actual strength of the structure under the penny tiles, correct? Were someone to drop a fully loaded, Costco sized shampoo bottle and it lands on one tile, it stands a higher chance of denting the foam beneath? But the mud bed wouldn't. Yes, the concern is based on point load. Epoxy would help some, there are thousands of foam pans out there with pennies and pebbles set with thinset and cement based grout. As long as the subfloor is sound, the pan is installed properly, and the persons using the shower aren't extremely overweight it should be fine. I was going to take exception to that when I first saw it, but I was finishing off a bag of Doritos. I'd like to point out that what you have spent up to this point isn't really lost. You might sell the tray online, and it's always best to have the drain centered. The only way the tray is worthless is of it doesn't work. That would mean if it doesn't drain properly, or if it gets dented before or after the shower is finished. Took the Schluter part 1 class my team won! may I ask if you are going to use a kerdi tray when do you install it? after you tile most of the wall? or at the beginning and then put some protection on it? I know in tile class we talked about how it will dent with a knew and delaying installing it. and of course protecting it with a pad of some sort more than cardboard.? Last job I did installed kerdi system as per video, waited then came water test, I installed the tiles on the pan and set finished drain while I tiled floor of the bathroom. Grouted the 1x1 with ployblend sanded grout. Cut cardboard for protection then I lay down a scrap piece of 1/2 plywood. Then I start wall tile. Didn’t catch your question until now. Was starting on the kitchen project. I used Henry Liquid Backerboard. It needs a primer to adhere to plywood. Probably wound up with about 1/2” on the high side and a tad over 3/4” on the low side. It claims to be good down to a feather edge. Worked for me; that’s was what was important on the Chesterfield side of the ‘riva’.